Mario Carbone and Rich Torrisi bring the Italian seashore to the High Line. 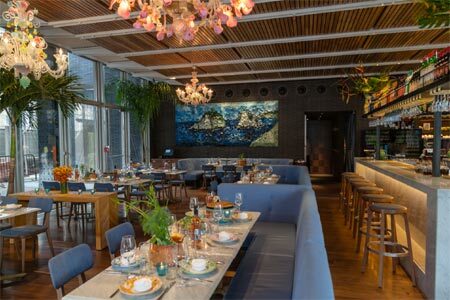 : Walking into Santina, a glass box underneath the High Line in the Meatpacking District, feels a lot like entering a beachside Amalfi Coast restaurant in the 1950s. Italian covers of Mel Torme seep from the speakers, palm trees reach the ceiling, and the waitstaff is clad in colorful polo shirts. From chefs Mario Carbone and Rich Torrisi, the restaurant is meant to focus on coastal Italian fare, and indeed it does. The problem is that there are dishes, like chitarra Santina, for which the menu offers no description, making the friendly staff work overtime having to explain nearly everything. That pasta, by the way, is excellent: long, thick egg-heavy noodles wrapped around mussels and ground lamb. And as is the case with this item, Carbone and Torrisi have also invented other Italian dishes. When they prepare an extant recipe, it’s never traditional. For example, the sauce in the very good tortellini Sorrentina comes with pesto, something you’d never find anywhere in Sorrento. Lamb meatballs with spaghetti squash and sage are fragrant and tender. Grilled swordfish with green tomato and olive relish tastes fresh and bright. Desserts are worth considering, particularly the well-executed cannoli and the hazelnut orange cake. The wine list, affordable and long, skews Italian. Cocktails, such as a vodka, Aperol and citrus spritz, are crowd-pleasers. The brunch menu features options like a shrimp frittata and a kale and pumpkin salad.